For the past month or so, Samsung and Apple have dominated headlines with their patent trial. Such a case was probably inevitable – how many ways can you design a smartphone? – but any such case would inevitably gather daily headlines. After all, it was Apple and its iconic iPhone vs. Samsung and its status as world’s largest smartphone manufacturer. They’re both kings of the industry in their own ways. Yet they could have a competitor breathing down their necks before they know it. Lenovo has been around for a while, and in their time they’ve made some waves in the laptop sector. Remember the IBM Thinkpad? In the late 90s and early 00s it seemed as though everyone had one. When IBM exited the consumer electronics business, they sold the brand to Lenovo, who have continued to the line to this day. They’re not quite as ubiquitous these days – the MacBook has taken over the role of the Thinkpad – but it’s still a high-quality Windows offering. In fact, it’s one of the main ways in which Lenovo competes with Apple. 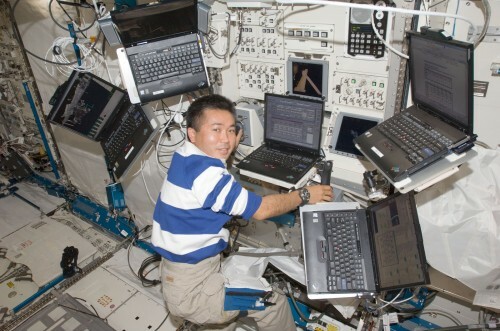 ThinkPads being used on the International Space Station. Let’s face it: laptops won’t be around forever. They’ve evolved to get smaller and smaller, but the latest round of laptops appears to be their evolutionary end. The only way to make them smaller is to remove the hinge, and when you remove the hinge from a laptop you don’t really have a laptop at all anymore. 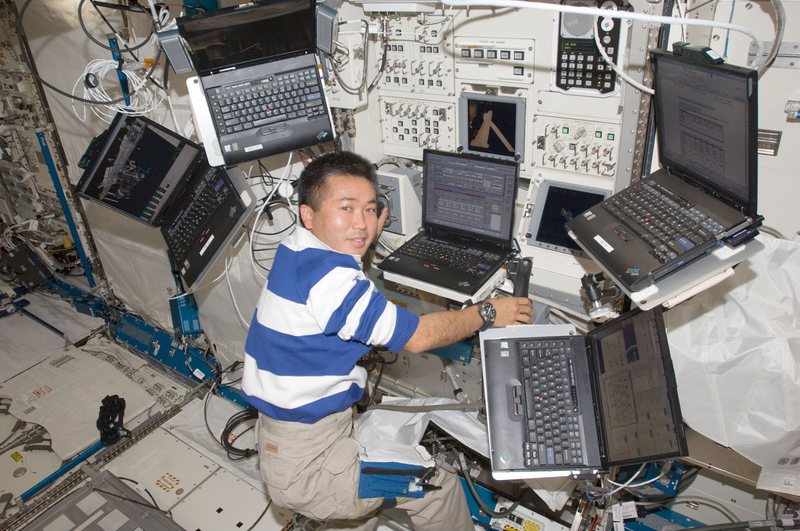 Still, the latest round of laptops, dubbed Ultrabooks, has made quite an impression on the market. Apple started this trend years ago with the MacBook Air, but that model went through a few generations before it became a viable product. Once Apple got it down other companies followed. Lenovo got right on the trend, coming out with two lines: the ThinkPad, that business-class continuation of the IBM line, and the IdeaPad, a ligthweight, affordable Ultrabook meant for the consumer market. They are directly comparable to the MacBook Pro and the MacBook Air. The difference, of course, comes in the price. The 13.3-inch IdeaPad runs more than $450 cheaper than the 13-inch MacBook Air, and more than $250 cheaper than the 11-inch MacBook Air. The ThinkPad compares even better to the MacBook Pro. The Apple faithful might not have much of a need for a different line of laptops, but the average consumer can benefit greatly here. Fact is, most people simply do not need a Mac. PCs can do pretty much the same, and oftentimes more. The saved dollars can go towards products of the future. To complete the thought above, when you remove the hinge from a laptop you don’t have a laptop. You have a tablet. While tablets aren’t quite to the level of replacing laptops, they’re certainly travelling that path. Just take a look at the super-thin keyboard cover for the Microsoft Surface. The writing is pretty much on the wall. Soon enough manufacturers will deliver laptops that make us look at laptops like clunky relics of the past. In this territory, Apple is the undisputed king. People often ask me for advice on buying a tablet. They’ll ask, “is the new iPad worth it? Or should I get an Android tablet?” And I tell them that no, the new iPad isn’t really worth it; the iPad 2 is the second-best tablet on the market, and you can find it at a significant discount. Android tablets just aren’t there yet. But Lenovo has an idea. First, they’ve put down the idea of competing with Apple on features. Samsung did this with the Galaxy Tab 10.1, pricing it at the same as the iPad. Seeing the two products next to each other, who was going to choose the Galaxy Tab? Lenovo has dipped below the iPad’s $500 base price. They’ve also differentiated, offering four different tablets: three Idea Tablets, ranging from 7 to 10.1 inches, and a ThinkPad tablet, designed for business. Again, Android has a ways to go when it comes to tablets. But it appears that Lenovo has something going with its segmented offerings and skinned Android interfaces. It would be interesting to see if Lenovo decided to compete on all levels by offering a smartphone. It seems as though everyone’s doing it these days, and with AT&T and Verizon supposedly pushing customers away from the iPhone there might be an opening here. And again there’s a chance for Lenovo to segment its offerings, using Android for consumer and BlackBerry 10 for enterprise. Yes, BlackBerry is something of an afterthought these days, but they do appear to have a strong offering with their BlackBerry 10 operating system. Problem is, they might need some licensing help to get it off the ground. Lenovo, which already has inroad to enterprise customers, could combine with RIM, which is – or at least was – the enterprise leader. On the other side, creating Android smartphones shouldn’t be such a big deal. Yet the competition issue comes into play here, too. Apple dominates its own little space, which consumes quite a large portion of the overall market. Samsung seemingly dominates the Android space. No one really dominates the Android tablet space, though, because it hardly exists. But if carriers really are pushing Android smartphones, there could be opportunity there. I’d like to believe that we’ll soon enter the era of the smart consumer: one not dominated by fads and iconic brands, but rather by utility. The average consumer does not need a Mac, yet might feel as though they need one because everyone else has one. In truth, many other companies can fit the bill. Lenovo fits right in there. And if you don’t need a product and can save money buying a comparable one, doesn’t that make the most sense? Wouldn’t it be more sensible to buy a $700 laptop and a $400 tablet for less than you’d spend on just a MacBook Air comparable to the other laptop? It makes sense to me. Joe Pawlikowski has been writing about mobile technology for the last five years. He writes and edits several blogs across the web, including Prepaid Reviews, which focuses on prepaid smartphones and services. He also writes blogs about baseball, BlackBerry, and the life of a telecommuter. You mention how you feel that laptops will start to become old tech with tablets and smartphones taking over, but what of desktops, are they destined for the scrapheap too? The idea of desktops dying out is an interesting one, but I can’t see it happening for some time now. I think we’re closer to seeing laptops phased out, because tablets are a close facsimile. With desktops, it’s tough to remove the element of the big screen. It comes in handy in so many ways, and for now it doesn’t seem that a portable device could replace the desktop. Eventually? Of course they’ll be gone. I have no idea what would replace them, but to say that a current form factor is timeless is to ignore the history of technology. All things said and done. The Kindle was/is a tablet which is lighter, nearly as useful and much more cheaper then the iPad but did it sell more than the iPad? Dell, also compaq and lenovo, came up with a series of laptops with a great interface, decent design, much cheaper then the macbooks but are they as popular? The point is, people look for exclusivity, best of the best technology available to them and a feeling of significance. Apple’s given it to them ! I’m one of the people who want another company to establish a similar niche Apple has, but at the same time, I’m quite skeptical of the occurrence of such an event. I tend to think that there will be a place for the laptop and also for the desktop (in some form) for some time. A lot of the really powerful laptops that I have seen have a tendancy to overheat and most tablets are quite underpowered compared to your best desktops. When they can develop a superfast tablet that has all of the storage and processing power of the best desktop (and which doesn’t overheat) then it will probably signal the end of the laptop and desktop. I loved my IBM Thinkpad back in the day. It has been replaced by other laptops, but I’m pretty sure it would still work if I got it out of the cupboard today. I agree with what you say about buying a cheaper laptop and tablet instead of buying a mac book air, however I’m sure many apple fans would prefer to stick with an Apple OS. I do wonder if technology becomes less reliable the more advanced it gets! Apple really have created such loyalty that other brands such as Lenovo often don’t get a look in. However, I agree there are plenty of other laptops out there which provide just as good, if not better functionality than Apple, it’s often just about doing your research. What are you looking for, and what is your budget? You make a very good point Holly, different laptops suit different people, it depends on your needs and budget.